FILE - Ben Emmerson, U.N. special investigator on counterterrorism and human rights, is pictured at U.N. headquarters, Oct. 21, 2016. He says the Saudis gave him access to top officials overseeing the country's handling of sensitive terrorism cases. A U.N. rights expert visiting Saudi Arabia as part of an unprecedented invitation by the government to assess the country's legislation and actions in fighting terrorism said Thursday that he was not given access to imprisoned bloggers and activists. Special Rapporteur Ben Emmerson said he was, however, given rare access to top officials overseeing the country's handling of sensitive terrorism cases, including those of human rights defenders serving sentences under sweeping security legislation. In his preliminary findings , Emmerson expressed concern about reports of the use of torture to extract confessions and due process violations by the Specialized Criminal Court, established to try terrorism cases. Speaking with The Associated Press from Riyadh, Saudi Arabia, Emmerson said: "The picture is extremely mixed." He said the Saudi government has gone to incredible lengths to humanely rehabilitate Saudis convicted in terrorism cases, while at the same time it has prosecuted and jailed citizens who have spoken out, under broadly worded anti-terrorism legislation. In 2014, Saudi Arabia issued a law that allows the kingdom to prosecute as a terrorist anyone who demands reform, exposes corruption or otherwise engages in dissent by deeming these as acts that could undermine national security. Emmerson said he made clear during his conversations with Saudi officials that the kingdom's current definition of terrorism falls short of international standards. He described the prison conditions for those convicted of terrorist activities as "far-sighted, imaginative, extremely well-sourced" and more humane than any other place he's seen in the world handling terrorism suspects. Many of them are young men who did not engage in deadly acts inside the kingdom, but had planned to join extremist groups or fought abroad and returned disillusioned. "On the other side of the coin, there's the darker side of Saudi Arabia and in particular the potentially pervasive culture of fear and the fact that individuals are being imprisoned for the exercise of the right to freedom of speech and opinion," he said. His request to meet these individuals was denied. The government cited technical reasons for denying him his request, he said. 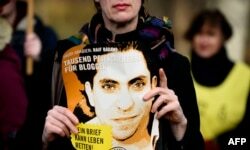 FILE - An Amnesty International activist holds a picture of Saudi blogger Raif Badawi during a protest against his flogging punishment, in front of Saudi Arabia's embassy in Berlin, Germany, Jan. 29, 2015. Among those Emmerson requested to see was Raif Badawi, the liberal Saudi blogger whose public flogging drew international condemnation. Badawi is serving 10 years in prison for insulting the kingdom's powerful ultraconservatives on his blog. Meanwhile, Saudi Arabia's de-radicalization program is among the most revolutionary for its handling of would-be and former terrorists. Its program focuses on changing the mindsets of people lured to extremism. A key element of the kingdom's rehabilitation program is the Mohammed bin Nayef Center. There, men who have already served their prison sentences are permitted in some cases to attend important family events, given psychological care and have access to a pool, gym and even art therapy. While there is no indication Saudi Arabia is on the verge of changing its definition of terrorism to exclude political speech, Emmerson welcomed the U.N. visit as a step in the right direction. "The most important indication is that they invited me to come to Saudi Arabia to review their counterterrorism provisions," he said.